Charles Frazier was born in North Carolina and educated at UNC. After receiving his B.A. in 1973, he attended graduate school in English, but turned to writing novels during the 1990s. 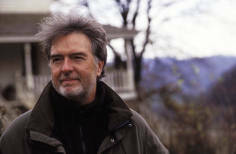 He won the National Book Award in 1997 for Cold Mountain. Based on an ancestor of his who fought in the Civil War, it relies on meticulous research in local history and the distinctive vocabulary of the nineteenth-century southern mountains. It was made into a motion picture in 2003. His second novel, Thirteen Moons, is also set in the North Carolina mountains and deals with Cherokee history.